Chiropractic specifically addresses the structural alignment of your spine and limbs, as well as bone, joint and muscle strength and function. Chiropractic adjustments correct misalignments of your joints, which in turn restores proper joint mobility, enhances muscle function, relieves pain, preserves bone and joint integrity, relieves pressure and irritation on the nerves and promotes healthy nerve supply to your organs and body systems. 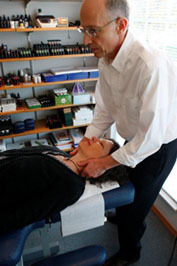 In Wichita, Dr. L'Hommedieu utilizes his skills as a chiropractor in conjunction with other natural techniques including acupuncture and kinesiology.